Latest: Admission Process for of JIPMER MBBS 2018 has been closed. Candidates can check the notice for same. Check here for the official notice. Name of college – Jawaharlal Institute of Postgraduate Medical Education & Research (JIPMER). Admission on basis of – JIPMER MBBS Entrance Exam 2018. Date of Exam – 03 June 2018. Mock test for JIPMER MBBS Entrance Exam 2018 is available now. Candidates, who are going to appear for the exam, can take the mock test and prepare for the upcoming exam to be held on the scheduled date. The direct link to take the test has also provided below. Mock Test: Click Here to give the mock test of JIPMER MBBS 2018. Number of JIPMER Seats to be filled for MBBS session through competitive Entrance Examination conducted is as follows. Seat details of admission session is represented here under. OPH – From the above seats, as per rules seats are allotted to eligible OPH candidates on horizontal reservation basis. Candidates who fulfil the eligibility criteria need to apply online at www.jipmer.edu.in. 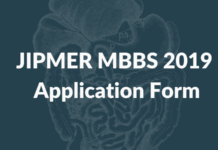 It must be noted that the JIPMER MBBS 2018 Application Form is to be submitted only ONLINE. The application fee is Rs 1500 for UR / OBC candidates, Rs 1200 for SC / ST candidates, Rs 3000 for NRI / OCI candidates and OPH candidates are exempted from application fee. Candidates will be issued admit card of JIPMER MBBS 2018. The hall ticket must be brought on the day of entrance test at the examination venue. Entry in the hall will not be allowed without JIPMER MBBS 2018 Admit Card and valid identity proof. It must be noted that the admit cards will be available online only at www.jipmer.edu.in. They will not be sent via post or any other means. The MBBS admissions are done on the basis of JIPMER MBBS Entrance exam. It will have multiple choice questions and the questions for JIPMER MBBS Entrance Examination will be based on the syllabus for XI and XIIth. The pattern of JIPMER MBBS Entrance Examination: There are total 200 objective questions. Each answer with correct response shall be awarded FOUR marks. ZERO mark will be given for the question NOT answered. For wrong answers, One mark will be deducted. All questions will be of ONE best / correct response type having four alternatives. The pattern of JIPMER MBBS entrance exam is as follows. It is an online exam in computer-based test mode. Institute does not release answer key of JIPMER MBBS Entrance Exam 2018. As question paper is also not available, coaching centers also do not publish answer keys. Entrance exam held by JIPMER Puducherry is fair and transparent and candidates take to social media to discuss how well their exam went. The result of the entrance exam is expected to be declared On or Before 20th June 2018. JIPMER MBBS 2018 Results shall indicate the list of qualified candidates. Only such test takers who get marks more than the qualifying / cut off marks will be in the merit list. Marks secured in exam equals number of correct answer multiplied by 4; 1 mark will be deducted for incorrect answer. Raw score so obtained is used to calculate percentile score. In order to check result of JIPMER MBBS 2018 entrance exam, candidate will be required to check the list of qualified candidates, known as the merit list. The cut off marks is decided by JIPMER taking into consideration factors like difficulty level of exam, performance of candidates, and seats availability. Last year’s cut offs are given Here. The JIPMER MBBS 2018 cut off rank and marks, for each category, will be published along the result and merit list. Such candidates who secure a rank in the JIPMER MBBS 2018 Merit List, will be called for counselling. Seats at Jawaharlal Institute of Postgraduate Medical Education and Research will be assigned as per merit obtained, subject to fulfillment of eligibility criteria of each candidate. Those who are going to appear for the entrance exam must check the official website after results declaration, for updates on counselling. The process will also involve verification of documents. Hence candidates must keep ready original official documents, for submission, at the time of MBBS Counselling. Usually, education experts say that JIPMER medical entrance exam is easy. But students choose to differ. They say that JIPMER MBBS 2017 paper was tougher than what they faced in sample papers of JIPMER or past year papers of JIPMER. Physics was moderately tough. Questions were from the syllabus and required implementation of knowledge and calculations. They found it lengthy. If a candidate attempted physics in end then they skipped a few a questions as they could not complete it. Chemistry was easy. It was mostly theoretical. Biology was moderately tough. Maximum questions were from NCERT only some required knowledge from other books. In one shift students found questions to be more from zoology than botany. English and Logical Reasoning was toughest. Students found that to attempt this section was most difficult. They were a bit surprised by the fact some questions in Logical Reasoning were on antonyms and synonym.